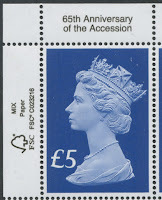 As previously mentioned the stamp issued to mark 65th Anniversary of the Accession of HM The Queen has been roundly criticised as unnecessary, not for the commemoration itself but for the issue of a £5 stamp rather than some other format. SO what possessed the Stamps and Collectables team to decide that it would be a good idea to resurrect the 1977 Machin format for high values (when £5 was worth £5!) and use it for this commemoration? And is it a definitive or a special stamp? It's been announced to us as a definitive, but it has a commemorative iridescent printing, and a commemorative inscription in the margin, like a special stamp. Like other special stamps, there is no printing date or sheet number. Like other definitive stamps the year of issue/production is included as a secret code in the iridescent print. And how are ordinary collectors to obtain these? If you have a standing order with Tallents House for special stamps you will probably NOT get these. If you have a standing order for High Value Definitives you probably WILL. I can't be sure, but the lass in Sunderland (didn't know that was an outpost of Scotland, did you? That's where Tallents House calls are handled now.) thinks that they are probably regarded as definitives for standing order purposes. But if you gave up on Tallents House standing orders last year because of their (still) astonishing accounting systems change, and lamentable service, you can buy them at your post office, right? Wrong! Of course we know that since Post Office Ltd moved your friendly sub-post office into the nearest convenience store it now opens all hours so you don't need time off work to buy your stamps. But under the new Network Transformation 'Locals' scheme these branches no longer stock special stamps - except at Christmas, when 'ordinary' customers would complain. The dwindling number of collector customers don't matter. But that still leaves about 8,000 out of the roughly 11,500 branches? Well no. If you live in England outside Berkshire, Cambridgeshire, Cheshire, Cornwall, County Durham, Devon, Essex, Gloucestershire, Greater London, Hampshire, Hertfordshire, Isle of Wight, Lincolnshire, Norfolk, North Yorkshire, Nottinghamshire, Surrey or Wiltshire you are out of luck. Likewise in Scotland if you are not in Edinburgh or Glasgow. And if you are in Wales or Northern Ireland, forget it - neither the Post Office nor Royal Mail want your money. Yes, the full list of 27 includes the House of Commons (so that makes 26), and the Isle of Wight (well, that saves locals from having to pay for a ferry). UPDATE: Add Goring-by-Sea, Sussex, to the list because they are selling them as well. So, in answer to questions, yes I'm sure it qualifies for catalogue status because it is readily available at some Post Office branches. It would be a serious and significant step if the Stanley Gibbons catalogue editor decided to relegate any modern British stamp sold at a post office to a footnote in history. But maybe that is the wake-up call that Royal Mail needs? Maybe I'm shooting myself in the foot by putting of genuine collectors, but there are plenty of older stamps around to collect, and to deal in. SO will this be in your collection? I will buy it as I'm a 'completist' but grind my teeth in the process of doing so. 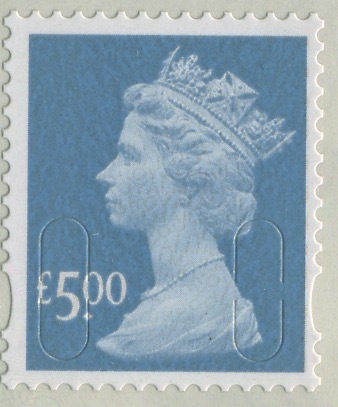 At least they could have put a bit more effort into it, just with the GBP10 Britannia stamp way back then - this is still one of my favourite stamps for sure. As for the standing order dilemma, I cancelled mine a long time ago and only order via their online shop nowadays. What annoys me most though is that their Stampex overprints have only been available via Stampex - I live oversees and have to resort to eBay and end up paying a premium. The RM's stamp division should be put under more scrutiny imho. Looks like Windsor is the neatest to me. A 45min drive each way and I would spend more in fuel and parking than on the stamp! Why is Royal Mail so against stamps? Yet release new issues at a prolific rate. Yes it will be going in my collection, but it will be a mail order purchase. Regarding Catalogue status I remember the Gibbons editor giving a talk at the International Exhibition in London in 2015 and he said that it was his policy to qualify anything that was available from a country's Philatelic Bureau for listing in the Stanley Catalogue. So, based on that policy (which may or may not be reasonable) the new £5 easily qualifies for full Catalogue status. Strangely however this policy does not apply to Stamperija countries or many issues from IGPC countries (quite reasonably you might say). However this situation does reflect a gross inconsistency in the Catalogue editor's approach to excessive issuing. What's sauce for the Sierra Leone goose ought really to be sauce for the Royal Mail gander. Maybe in time a more aggressive editorial approach to excessive issues or issues not readily available to most of the mail-sending public might improve matters as collectors would feel less pressure on themselves to obtain such items. But many would moan and no doubt the editor can live without such hassle. Looking at the list of Post Office branches they all look very familiar (except the House of Commons) especially if you can remember those good old days of the Post Office Philatelic Counters where you could buy all sorts of stamps. Pity I could not buy any today in Sussex. Back in those good old days I used the Philatelic Counter in Preston (Market Square) to buy stamps for actually putting on letters - because there was no queue! I presume they must have taken any part sheets of commemorative issues off the main counters when a later issue came out and all of these ended up in one book at the Philatelic counter - so you could ask for 3x 1st class and get a random selection. As regards the list of post offices there is not a single one in all of the counties of the West Midlands and only one, Nottingham, in the total area of the Midlands counties. Perhaps it's Royal Mail's revenge on the Brexiteers or perhaps Royal Mail doesn't think that people in the Midlands have £5 to spare. Meanwhile, I see you East Angles fare quite well with Cambridge, Norwich and Essex appearing on the list. Ah well, those of us in the rural backwaters have escaped with some of our Crown Offices still intact as compared to you brash midlanders! Seriously though, I haven't yet compared this to the recent list of Crown Offices to see which ones don't get a mention. I'm in Boston, where the Crown office bit the dust some time back......but the building it occupied is still up for sale. Maybe if we club together we could buy it and turn it into its former glory days, with something vaguely akin to a philatelic counter. It looks like the cancellation of the planned Tube strike today has saved me from a number of potential wasted journeys, as none of my local POs, which allegedly stock 'collectibles', is on the list. (Why doesn't the Post Office branch checker have an option for philatelic items?) I would have gone mental if I'd had to trek round looking for a branch. What a shambles. There is a tick box for 'collectibles''. But that wouldn't help because Dereham is on that list and is not one of the 27. I have mixed views on this particular stamp. I haven't collected commems in 30 years (and I was a teenager then), but I do have a LOT of Machin material. Until now my rule was it had to be the classic Machin design, so the George V PSB from a few years ago with the commems with a Machin head did not make the cut. Maybe I should save my money for a shot at some of those trials from the other day! Watch this space for any information after Stampex. I visited the Gloucester Post Office today and the only items they had that included this stamp were coin covers - they hadn't even got the presentation packs. The staff told me that a number of people had asked about them so clearly the news hadn't got out. I'll not be able to visit Stroud until the weekend at earliest but I can see if they have any left. I work at Goring-by-Sea Post Office and we have stocks of both the loose definitive and the Presentation pack. We are in Sussex, not on your list. Feel free to visit 292 Goring Road. Thank you for the news and well done for having these. What type of branch are you, Crown, Main, Local, SPDO? We are a sub-post office but will be a main shortly. We have a large stock of philatelic products and Royal Mint coin packs too. At the risk of repeating my previous comments, there is absolutely no commercial reason for a Crown or equivalent franchise Post Office to hold this kind of stamp or to have a "Philatelic Counter". The income received by POL for the sale of any sort of Postage Stamp is incredibly low and the amount passed on to a franchisee / postmaster is approx 3% of face value of the sale. As a relief Postmaster I rather like covering PO local branches as they aren't innundated with commemorative stamps that, other than collecters, people consider a bloody nuisance...not self adhesive, etc etc. If collecters have a genuine desire for this sort of product please order it directly from RM and don't expect your local PO's (even Crown's) to stock niche items that are low sale volume, low income and in a commercial operation totally pointless. All of which would be fine if RM would actually tell you sufficiently far in advance what was going to be available (with pictures and technical information, like sizes) and make arrangements for the stamps to be with collectors on the day issue so that collectors could produce FIrst Day Covers. Other countries can manage this, why not RM? Thank you once again for putting the perspective of the local PO. However, you must accept that historically all special stamps produced by the postal service provider (under whatever name) have been available from probably 95% of the post office branches in the country. While the service provider continues to produce pretty stamps for postage, the expectation that these will be widely available from the retail outlets is not unreasonable, albeit the retail outlet is now operated by a separate company to the postal service provider. The fact that the service provider (Royal Mail) makes it more financially beneficial for the retail outlet NOT to use stamps is stupid, and it is perfectly understandable that operators of the retail outlet prefers to use labels. Royal Mail have to juggle the need for income to pay for moving letters and parcels with the need to properly pay their retail agent. It is not only collectors of mint stamps who want special stamps from their Post Offices. They may be few, but PostCrossers and other writers of social letters like using something different. Suggesting that customers should buy their stamps from Tallents House is like suggesting that people needing new coins should get them from the Royal Mint, rather than from the local bank - which makes no profit at all on the transaction. Incidentally when I posted the latest batch of orders at my local crown office I was discussing the £5 - a whole sheet actually needs a long but very light (Large) letter - the counter clerk said that he thought that they should have some. Given the wide publicity in the (ordinary) national and local press - Evening Standard, Daily Mail, Express, and the locals - it's not unreasonable for readers and collectors of 'Royal' memorabilia to pop into their local Post Office to buy them. Most people still regard the Post Office as somewhere to buy stamps and post letters/parcels, rather than buy house insurance or broadband, however much those products might be financially beneficial to the company. Bristol Galleries had stock today. They weren't aware that it was only available in a limited number of PO's. If Royal Mail did not regard collectors as such a bother then we would not have as much to complain about! I have all but given up and RM has lost most of my business and a few thousand a year. Bad customer service will eventually drive even the most committed away.